Those familiar with the baseball classic Bull Durham may recognize the line above. It is the one used by Annie Savoy, played by Susan Sarandon, as Crash Davis sets the all-time minor league home run record in utter obscurity, only the two of them aware of what he has accomplished. It signifies that many victories in life go unseen, unheralded by the masses. 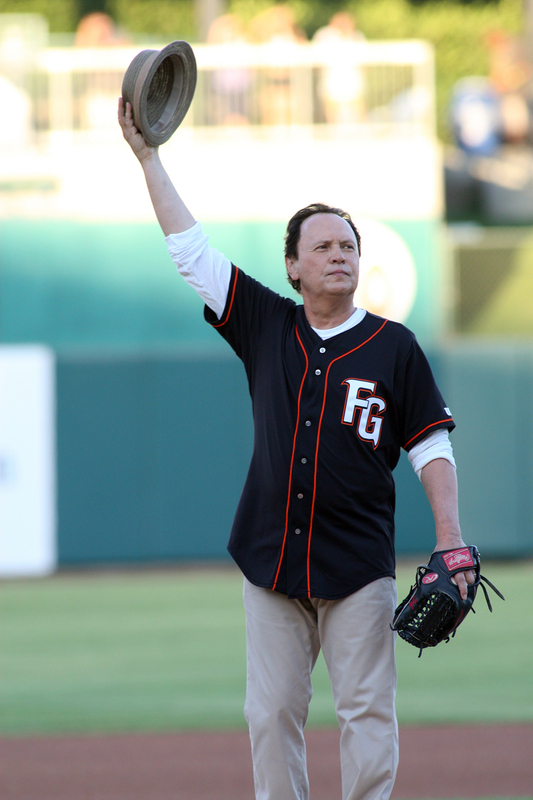 In that vein, most of the 12,161 fans that attended the August 27th contest between the Grizzlies and rival Sacramento were focused on the highly publicized story of the evening, that Billy Crystal was in the ballpark to film scenes for his upcoming motion picture. While the attention of the crowd was captured by the ballpark being transformed into a Hollywood set for the night, there was another script unfolding, one which even the most softhearted of tinsel-town producers would probably reject, considering it too preposterous to be believable. This is the story of Jason Stevenson. It is one that includes several acts, but which is perhaps just beginning to enter its most interesting phase, beginning with that night. Act One of Stevenson’s baseball career seemed promising enough. The Redding, California native was selected out of Sacramento City College in the 12th round of the 2000 First-Year Player Draft by the Montreal Expos, advancing as high as Triple-A by 2004. But in 2005, when the floundering Expos were moved to their current home in our nation’s capitol, Stevenson went just 6-14— including a 1-9 mark with an ERA over 10.50 at Double-A— and decided to hang up his cleats. From there, Stevenson’s life fell off track. He doesn’t like to talk about that period of his past; not in specifics, at least. He mentions in passing “the path I was on” or “troubled times”, referring occasionally to his time spent at “the bottom”. In spite of his lifestyle, though, somewhere in the back of his mind he knew the value of keeping his blessed left arm strong. He played a variety of sports— flag football, competitive softball— and kept himself active. Nevertheless, it took several years for his frustration and contrition to come to a head. He tried out for the independent league Chico Outlaws in 2009, but did not receive an offer. He did so again in 2010, but again manager Mike Marshall was not willing to sign him until Stevenson fully committed to becoming a professional athlete again, in every aspect of his life. Maybe the difference was finally realizing that he was playing for more than himself. He gained inspiration from the story of top prospect-turned-heroin addict-turned-MVP Josh Hamilton, whose story has risen to the national spotlight over the last couple of years. Stevenson took that story to heart, and felt he could provide the same inspiration to others through his own comeback. “I wanted people who may have taken the path I took once I gave up baseball to see that there is hope,” Stevenson says. As we speak, I notice that he doesn’t strike the eye as a natural athlete the way that someone like the 6’4”, 240 pound Hamilton does. Of course, the Rangers slugger was the first overall pick the year prior to Stevenson’s draft, going 344 spots above him. Stevenson’s blondish hair is buzzed close to the skin, the crown of a receding hairline creeping backwards around his scalp. Listed at 6’1”, 175, he is clearly in good shape but, having just celebrated his 30th birthday, is fighting the slow march of time in a room full of players mostly younger than him, and without a five-year career gap. Stronger in mind and body, Stevenson finally earned a spot with Marshall’s Outlaws this spring. All he did from there was go an outlandish 8-0 in eight starts, also earning a three-inning save in his lone relief appearance. He logged an ERA of just 1.68, striking out 76 in 64.1 innings of work. That was enough for the San Francisco Giants, Stevenson’s hometown rooting interest as a Northern California kid, to take a flier on the southpaw. 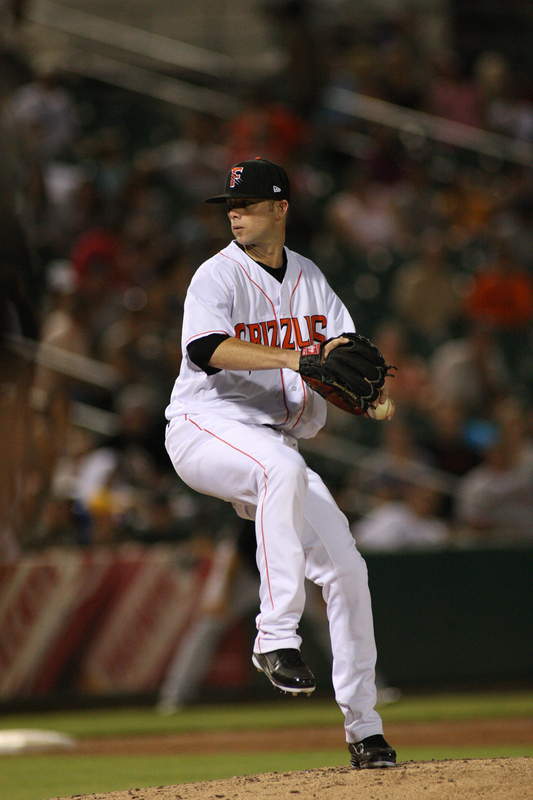 With a rotation depleted by injuries and promotion, the Grizzlies became Stevenson’s first professional destination, as he was penciled in for a spot start at Las Vegas on August 22nd. It was a far cry from Chico, and a much farther one from his life the past five years. His comeback began inauspiciously. The first batter he faced, Darin Mastroianni, homered. Stevenson surrendered a second longball in his first inning of work, the Grizzlies trailing 4-0 after one frame. But he settled in to shut the 51s down from there as he pitched into the seventh inning, allowing just four more hits while striking out seven the rest of the way. The offense did its part in the meantime, providing six runs of support to stake Stevenson to his first professional win in six years. That gave the southpaw another opportunity, as he made his first home start for the Grizzlies in front of a packed house in the penultimate home game of the season. Of course, most of the fans had no idea of his story, but that didn’t matter anymore. All that mattered was that he was finally back where he wanted to be, where he needed to be. With the cameras rolling on the action taking place around the ballpark, Stevenson quietly went back to work on the mound, home once again. This is a lesson he has learned and has paid dearly for. It is one he is reminded of every day, one that he will not need to learn again. Ed. Note: The 10-for-10 series is a chance for us at the Grizzlies to celebrate 10 years in Downtown Fresno by thanking 10 of our great fans. If you know a deserving fan who has helped support Grizzlies baseball that you would like to nominate, simply email us at grizzliesmedia@fresnogrizzlies.com. The word unique is one of the most overused in our society. We often call something unique when we really mean unusual, rare, or just different. The word should really only be used in its proper context, when we are talking about something, or someone, that is in fact one of a kind. That being said, Rich Palmer truly is a unique Grizzlies fan. So what makes Rich so different? Well, let’s start with the obvious. Palmer has had them ever since. He even considered purchasing an ownership stake in the team a few years ago, but ultimately decided that he preferred his vantage point as a fan. As such, he has built relationships with many in the front office, and often sits in the press box during games. The question, though, that no doubt comes up in the mind of anyone who is both a Giants and Grizzlies fan (of which Rich is both), is why he would choose to travel over 150 miles and nearly three hours to see Minor League Baseball, when he could be at AT&T Park in under an hour. In the answer to that question, one finds the many things that showcase minor league ball for the special property that it is. 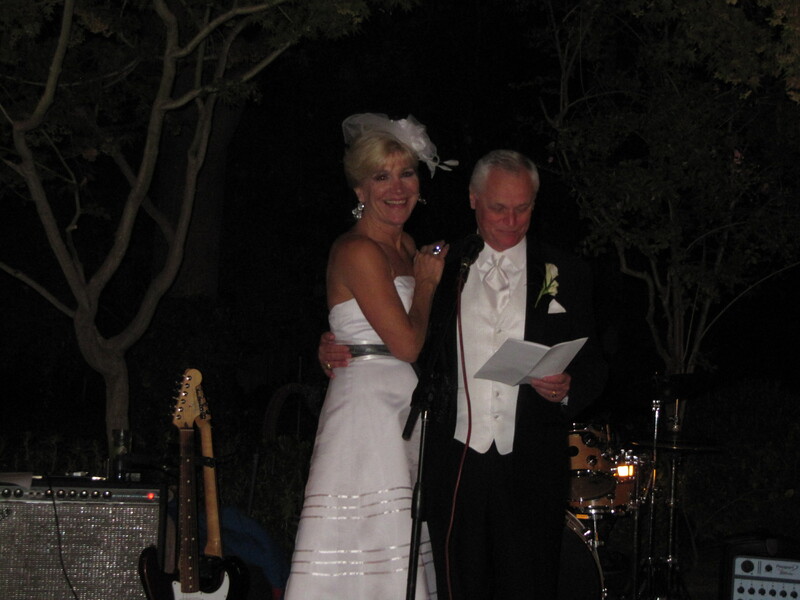 Mr. and Mrs. Rich Palmer at their wedding reception last weekend. As any veteran of games in the bay area— especially those at Candlestick Park— are aware, there is a significant weather advantage to the evenings in Fresno as well. And while Major League teams are increasingly mimicking the minor league model, stuffing their downtime between innings with other entertainment, the level of fan involvement in the friendly confines of the smaller ballparks remains more tangible and personable to Palmer. Of course, the difference in ticket prices doesn’t hurt either. While Rich has been invested in the team for a decade, he became much more heavily tied to both the Grizzlies and Fresno last year. That’s when he met Claudia Loyear, a longtime Fresnan who teaches and runs an interior design business here in town. But even though she had lived here her whole life, Claudia had never been to a Grizzlies game until Friday, April 16th, 2010. If you’re going to be introduced to baseball, Opening Day is not a bad way to go. Needless to say, it would not be the last time she came to the park. The Grizzlies did their part to make her first game a memorable one, erasing a 1-0 deficit with a run in the eighth and another in the ninth to walk off with a 2-1 win in front of a capacity crowd. But there was much more to the game that had Claudia coming back for more. And, well, there’s a bear too. Parker puts his stamp of approval on the weekend's festivities. Claudia has become one of Parker’s biggest fans, ever since he dropped by the couples’ seats during her first game. Some (read: Rich) might even call it a bit of an obsession. But Claudia’s appreciation of the game extends beyond just her friends and the bear. She has found a game that she loves right here in her own backyard. Having grown up on the much faster-paced sport of basketball, she enjoys the pedestrian meter that baseball provides. It has also allowed her to enjoy her summers with the man she loves, and to whom she is now married. 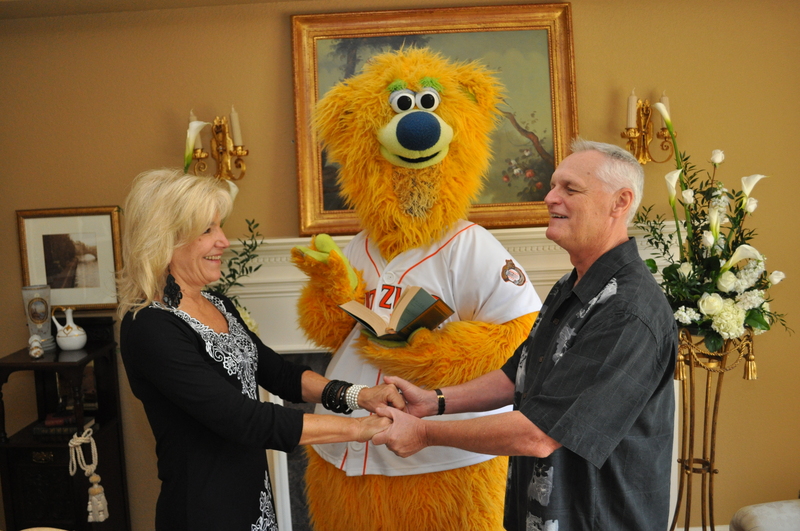 Rich and Claudia tied the knot over the weekend, in a private ceremony here in Fresno. Friends and family were treated to a beautiful reception at an estate on North Van Ness Avenue. After the speeches were finished and the wedding cake fed to one another the couple stepped out for the first dance of the evening. And what do you suppose the first song was? Why yes, “Take Me Out to the Ballgame”, at the bride’s request. Even the cupcakes given to guests were designed like baseballs, white frosting with red laces and an orange and black “P”, for Palmer, in the middle. But the weekend’s festivities would not have been complete without a visit from that mischievous bear. Nevertheless, Parker couldn’t help but show up for brunch at Claudia’s house the morning after the wedding. Always the show-stealer, he posed for pictures with the newlyweds, even posing to ordain the couple in front of the baseball gods. Now that it’s official, we can’t wait to host Mr. and Mrs. Palmer for their first game as husband and wife on Opening Day, 2012. Great, cheap, local food on dollar beer night. 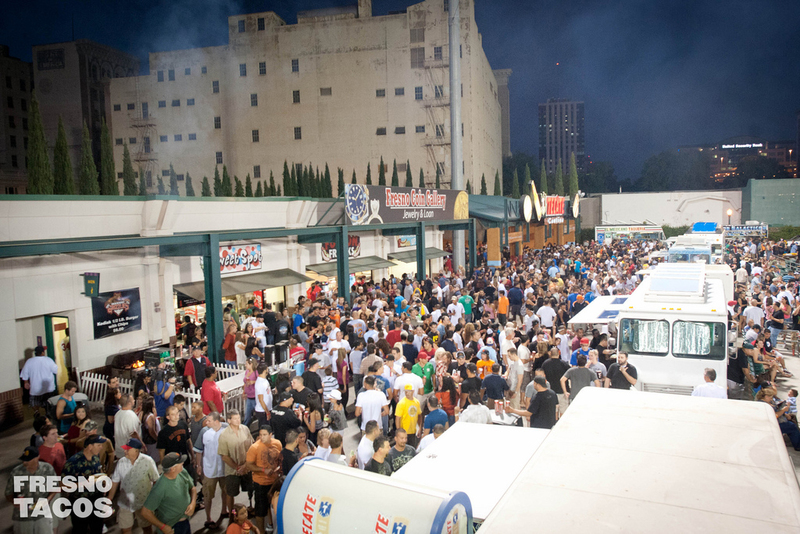 When the Grizzlies and Fresno “Blogfather” Mike Oz came together to hatch the idea for the inaugural Taco Truck Throwdown, the idea seemed like such a no-brainer that it was hard to imagine that nobody had done anything like it before in a venue like the ballpark. A celebration of local food and culture, it was a chance for Central Valley residents to come together to support their favorite roadside eatery, try some new ones on for size, and cast their vote. While the concept seemed like it would resonate with local residents, it is safe to say that none of us had any idea it would be as popular as it turned out. Now the Taco Truck Throwdown has been nominated in the “Miscellaneous” category along with nine other promotions for Minor League Baseball Promotion of the Year! If the Throwdown wins this round of voting, it will go on to become a finalist for overall MiLB Promo of the Year, so we need your help. Vote up to 25 times here between now and October 13th and help the Grizzlies, the City of Fresno, and the Central Valley get recognized for this great event. In case you missed out, here’s a little background on how the Throwdown went down. 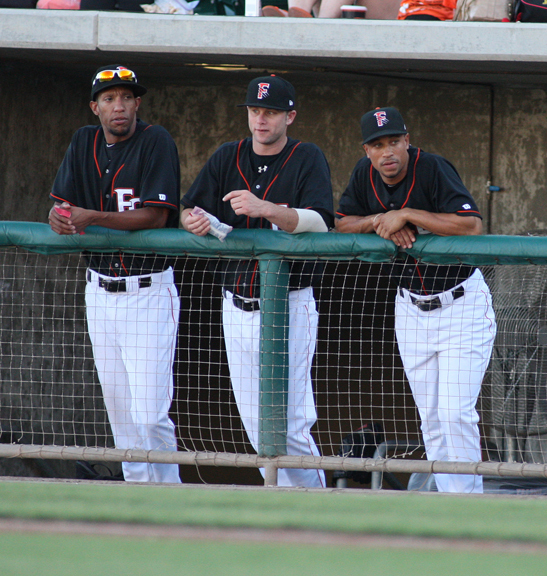 After an extensive search of the Valley, seven local trucks from Fresno, Fowler, Madera and Sanger were invited to Chukchansi Park to take place in the competition, which took place on the final Thirsty Thursday of the season. The buzz surrounding the event picked up as it got closer, generating stories throughout the Fresno media. The local ABC, NBC and FOX affiliates, as well as local radio and a whole smattering of local blogs previewed the event. With the news out on the Throwdown, a stunning crowd of 10,287 swarmed the concourse from the moment gates opened to the general public at 6:05, all the way until 20 minutes after the game had ended. For more of the details on the trucks involved and the insane number of tacos sold that night, check out fresnotacos.com, the website created to provide more information about the event. You can also find the winners of the voting, as well as a fantastic photo album from the event. Thanks again to our great fans for helping make the inaugural Taco Truck Throwdown such a success! We’re looking forward to hosting more events like this at the ballpark in 2012. Vote now! Ed. Note: The 10-for-10 series is a chance for us at the Grizzlies to celebrate 10 years in Downtown Fresno by thanking 10 of our great fans. This is the first installment in the new series, which we will be running up to (and possibly through) Opening Day. If you know a deserving fan who has helped support Grizzlies baseball that you would like to nominate, simply email us at grizzliesmedia@fresnogrizzlies.com. When I started this series, I put out a call to you, the readers, to help tell the stories of 10 fans that have helped us celebrate 10 years together in Downtown Fresno. As I asked you all for submissions, I wasn’t sure of the response I would get. As it turned out, I was deluged by nominations, with one name standing out from the rest: Marilyn Meadors. 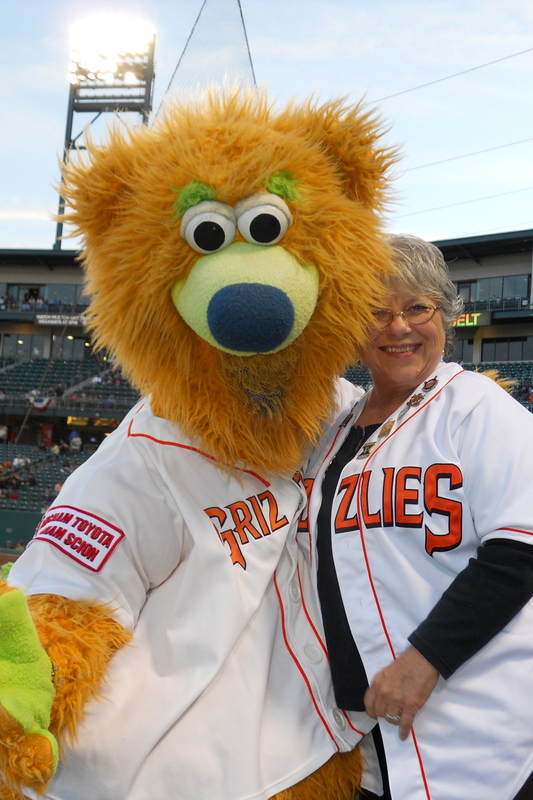 I must confess I had really only heard of Marilyn through fellow coworkers here at Chukchansi Park, so learning more about her was a revelation as to how big a fan of the Grizzlies she really is. Once from Dinuba, Marilyn and her husband Craig now live in Clovis, just 15 minutes from the ballpark. Why the relocation? “The Grizzlies actually were one of the reasons we moved to this area,” she said. When you attend as many games as Marilyn and Craig do, it’s no surprise. Marilyn is as close to a team mom as we have here in Fresno. When people talk about Minor League Baseball being a family environment, they are referring to the relationships that fans like Marilyn have with both the players and her fellow fans. “A friend of mine said ‘you wish that everyone of those players was your son’, and it’s true,” she admits with a smile. If the players are her sons (or grandsons), then her fellow season ticket holders are her brothers and sisters in this Grizzlies baseball family. She cited a number of different die-hard fans that have become some of her closest friends over the last decade. More than that, though, she talked about how excited she is to just come to the ballpark every day and talk to the casual fans who come to Downtown Fresno each season. When you have as many baseball memories as Marilyn does, it can be hard to pick a favorite. She listed a number, but a few stood out in particular. “The more recent one, of course, is just being able to sit and chat with Buster Posey at the meet-and-greet,” she recalled, speaking of the annual preseason event. 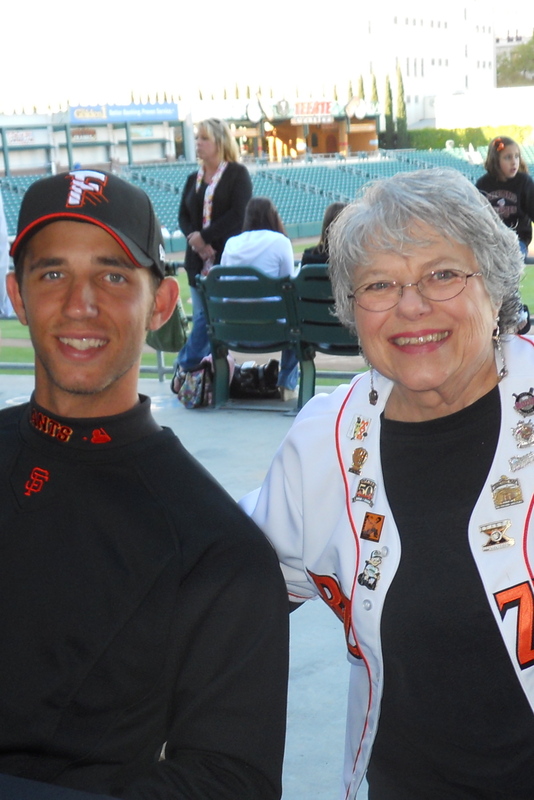 “I did get (Madison) Bumgarner to smile,” she laughed. I asked her what she was looking forward to the most this season, and she cited the next wave of upcoming talent, highlighted by the possibility of seeing top prospect Brandon Belt here in Fresno. Speaking of being young, Marilyn had also read the first installment of our 10-for-10 series, in which we profiled our youngest season ticket holder, 17-year-old Justin Renge. I’ll leave you with her observation, which is a great thought as we sit on the brink of another baseball season. And that, as much as than anything, is what baseball is all about.